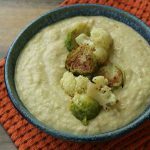 Place cauliflower and Brussels sprouts in a large bowl. Add 3 tablespoons olive oil and toss until evenly coated. Season with salt and pepper and toss again. Pour vegetables onto baking sheet and arrange so the Brussels sprouts are cut side down and pieces aren't touching. Roast for about 10 minutes, stir, then roast until tender (another 5 minutes or so). Remove from oven. While vegetables are roasting, heat a 3 1/2 quart saucepan over medium heat and add remaining 1 tablespoon olive oil and onion. Sauté until onion is translucent, then add broth. Bring to a boil, then reduce heat to low and simmer for about 10 minutes. Transfer two-thirds of roasted vegetables to saucepan and simmer for a few minutes, stirring occasionally. Remove from heat. If you have an immersion blender, purée the soup right in the pan and then stir in the coconut milk. If you don't, add the mixture to a blender or food processor along with the coconut milk and purée. Pour into 4 serving bowls, garnish with remaining roasted vegetables, and serve immediately. Watching fat? If you prefer not to eat the saturated fat found in coconut milk, substitute 1 cup of low-fat milk. Calories will reduce to 228, fat to 16g, and saturated fat to 3g. Cholesterol and sugar counts will increase slightly and the soup will no longer be dairy-free or vegan.